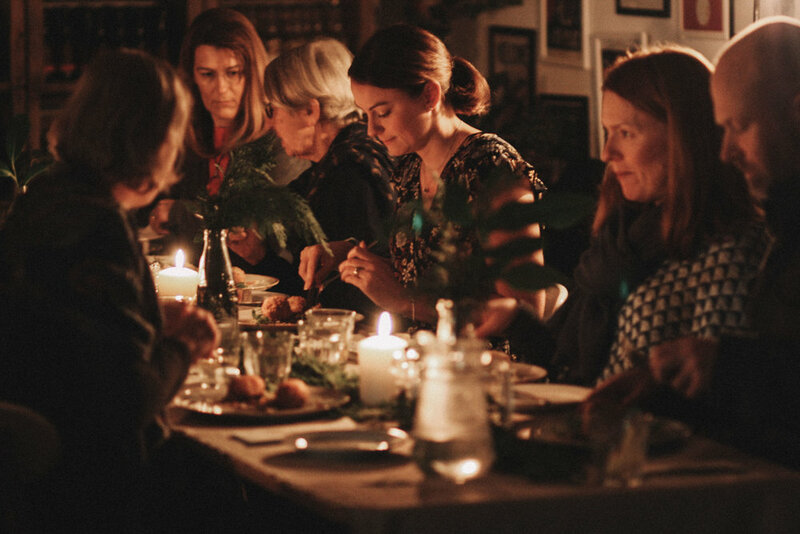 The last Saturday of November saw The Bridge Lodge, a foraging food company based in North Wales, team up with Hawarden Estate Farm Shop for the third time in their ‘Landscape Series’ of supper clubs. 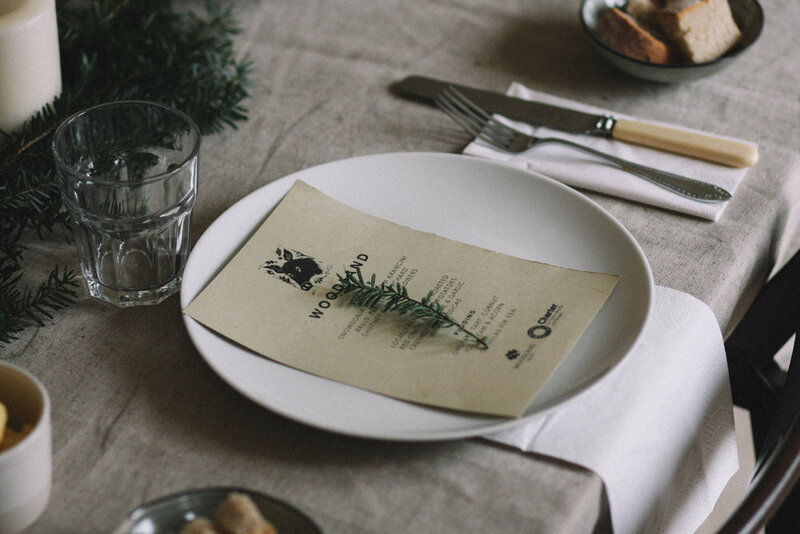 Angus & Lilly, who set up The Bridge Lodge in 2016, started this series of supper clubs to celebrate the diversity of the landscape in the British Isles and its wonderful array of culinary offerings both wild and cultivated. Having already explored the terrains of the ‘river’ and the ‘land’ for our first two supper clubs, we thought that our third supper club should celebrate the enchanting woodland landscape we have here on our isles and it’s unique edible delights. So ‘woodland’ supper club was created! Like we did with the previous supper clubs, we served a three-course menu and arrival foraged cocktail that celebrated the particular landscape, using its delicious offerings and including as many local and seasonal ingredients as possible. The day of our ‘Woodland’ supper club also landed on Tree Charter Day, a day to promote the awareness and protection of our woodlands and trees by signing the Charter. We thought it a fantastic idea to promote the day alongside our supper club, so we swiftly teamed up with the Woodland Trust to promote both events and gather signatures. The three-course menu was designed in such a way as to bring out the best of the flavours of the woodland landscape. Throughout the courses we used nine different trees (Douglas fir, oak, cobnut, apple, pear, wild plum, quince, almond and fig) and plenty of local and seasonal ingredients; mushrooms gathered from Snowdonia, Kentish cobnuts, handpicked fallen acorns, home-grown fruit and vegetables, edible flowers, locally-reared pork and mountain-grown salad leaves. On the evening the guests were seated in a warmly lit, snug corner of the farm shop. During the day we set up the table with local cloth, foraged pinecones, conkers and leaves that were then nestled between candles and vases filled with woodland branches. The menu started off with Snowdonia mushroom arancini balls served with a chutney – made with bountiful fruit picked in autumn from our trees here in North Wales – and topped with our local blue cheese Perl Las, marigold flowers and pea shoots. For the main, we used locally reared pig served with crushed potatoes with thyme and garlic, orchard puree, roasted cauliflower and purple sprouting broccoli served with a venison and mushroom jus. We used pig, as it was a tradition only decades ago for farmers to graze their pigs in woodlands, many of them feeding on the fallen beechnuts and acorns to fatten up. In recent times, however, our woodlands have become too fragile for this tradition to continue nationwide, only a very few still carry the tradition on. Continuing with the woodland and orchard theme, we served a frangipane tart of wild plum, quince and pear, topped with almonds. This was paired with a roasted cobnut ice cream and a sprinkling of acorn dust. The last serving was a Douglas fir tea, made by steeping the needles in boiling water and adding local Welsh honey to sweeten. With their woodland landscape supper being a great success, Angus & Lilly are now working on their next event, ‘Sea Supper Club’ You can keep up to date with news and tickets by following along on their instagram.